This set of 4 Anthropologie Mimira Teaspoons is just $12.95 ($3.24 per spoon) with free shipping (and returns) at Nordstrom. Description: Designed by ceramicist Lindsay Emery of Suite One Studio, this set of teaspoons exemplifies the North Carolina–based artist's knack for creating everyday refinement. 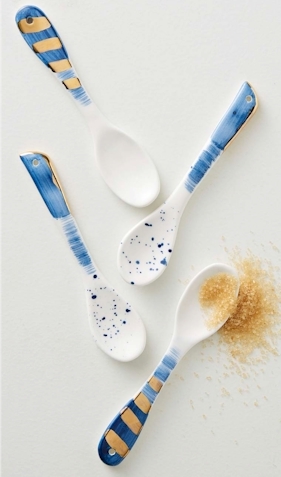 Hints of gold accentuate the vibrant watercolor patterns, making these spoons ideal accents for any table setting. for more great Passover deals.